Late April in Paris wasn’t quite the warm, spring paradise I had envisioned, but tended to be a bit chilly and rainy. The wet weather was no match for the beauty of Luxembourg Gardens and it actually worked in our favor, clearing out crowds and amping up the colors. The gardens surround the Luxembourg Palace, the former residence of Marie de’ Medici, widow of Henry IV, which now serves as the meeting place of the French Senate. It’s a traditional French style garden with heavy Italian influences and it has several large fountains, wide grassy lawns, and various pathways that wind through gardens and past sculptures. I found the garden to be a little too stark and orderly overall but there were plenty of magical moments to be had, including the mesmerizing rows of chestnut trees and the haunting Medici Fountain. 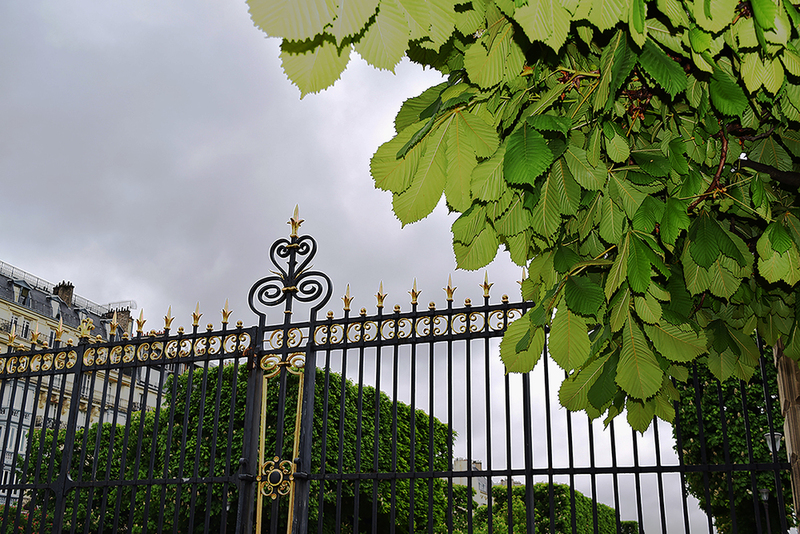 It was the trees that caught my eyes first, row after row of towering, perfectly-clipped horse chestnut trees that sit at the end of the main axis of the gardens. 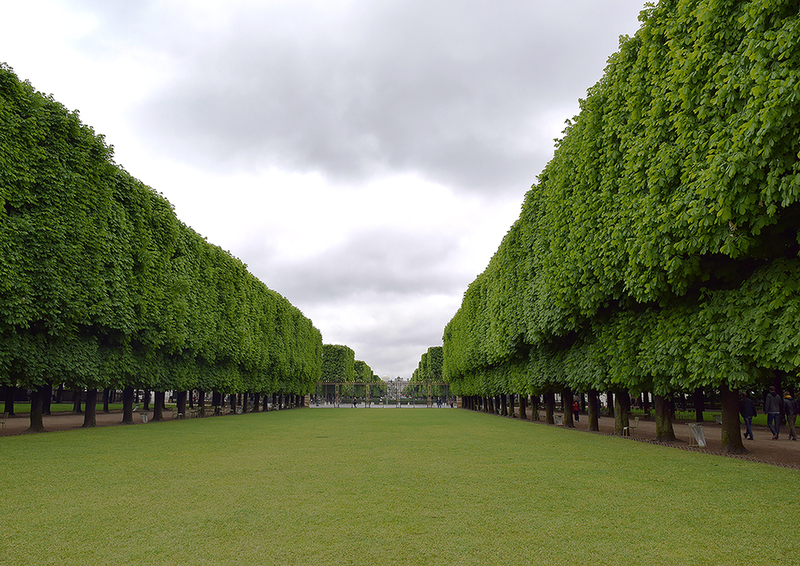 I saw this boxy cutting style in many of Paris’s most famous outdoor areas like the sidewalks along the Champs-Élysées, the Jardin des Tuileries, and at the parks along the base of the Eiffel Tower. But this was the most dramatic display I had seen interspersed with swaths of brilliant green lawns. Apparently these green spaces are usually completely crowded with Parisians picnicking and socializing on the weekends. I was so enamored with this particular section of the gardens that I created an entire photo gallery dedicated to these captivating trees. The central oval fountain is famously used by children to sail toy boats. It’s a great place for gathering but isn’t all that visually appealing. Tucked inconspicuously off to one side of the gardens is the dramatic Medici Fountain, an Italian style grotto with a long basin of water extending out from the front. It is framed by rows of plane trees whose branches are mirrored in the water below. The canopy of trees arching overhead diffuse the light, completing the intended simulation of a cave. The central sculpture Polyphemus Surprising Acis and Galatea depicts two lovers caught in the act and gives the setting a dark theatricality.